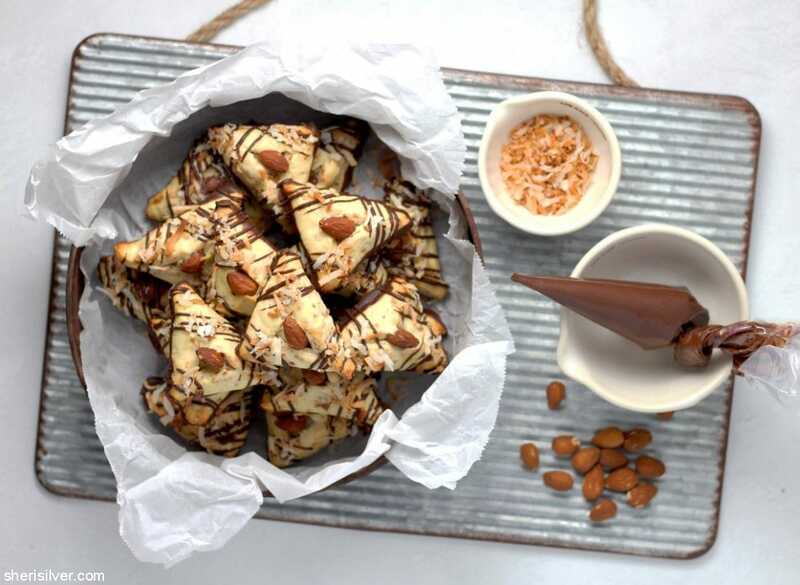 Much like my popsicles and muddy buddies, I love thinking up fun variations on the basic Hamantaschen recipe (typically apricot, prune or poppy seed filling) and sharing them with you! This year I had it in my head to make an Almond Joy version. Not sure why, as it’s not one of my go-to candies (I’m more of a Mounds gal, personally), but I knew the combination of chocolate, coconut and almonds would make for a delicious cookie. As re-makes go, these are probably the furthest away from the original, more “inspired by” than “copycat” version of, and I love the way they turned out. The first change I made was toasting up that coconut, as I think it’s way more delicious, and folded it right into the cookie dough (reserving a bit for sprinkling on top). Of course there had to be the traditional whole almond for the top, but I wanted to up that flavor here, and used almond paste for the cookie filling (delicious). And of course I finished things off with a dunk in some melted chocolate (and a drizzle for good measure). 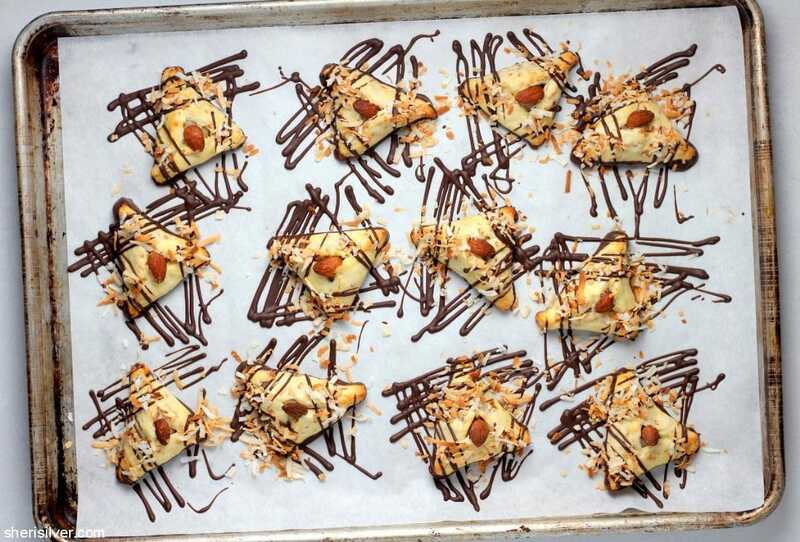 As I do, I’ve included my iron-clad tips for “hamantaschen success”, and would love to know if you try them! 1. Roll the dough to about 1/4″ thickness – this will seem too thick but a thinner dough will not hold its shape as well. 2. Use only about 1/2 teaspoon of filling per cookie – again, this will seem wrong, like, how can this possibly be enough? Well, here’s the thing: as the cookies bake, the filling expands and pushes the sides of the dough that you’ve so carefully, painstakingly pinched and shaped. The more filling, the more misshapen the finished cookie will be. If you don’t care about the look, and want more filling, you can go up to one teaspoon. 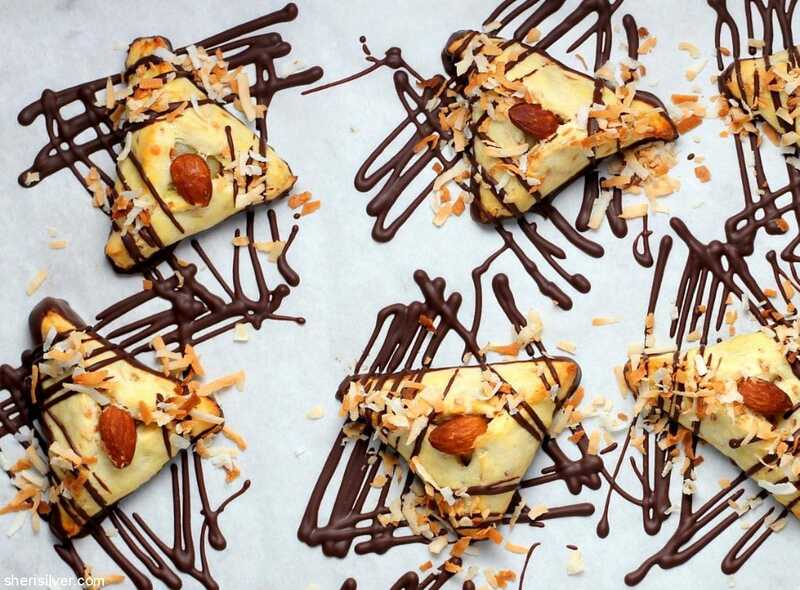 But your hamantaschen will likely not be as pretty. 3. Glue those suckers SHUT – an egg wash is essential to seal the sides. I always want to skip this step and always regret it when I do. 4. Freeze before baking – after the egg wash “glue”, stick your tray in the freezer for 10-15 minutes. This will pretty much ensure that your cookies stay intact once placed in the oven. Pre-heat the oven to 325 degrees; line a baking sheet with parchment paper. 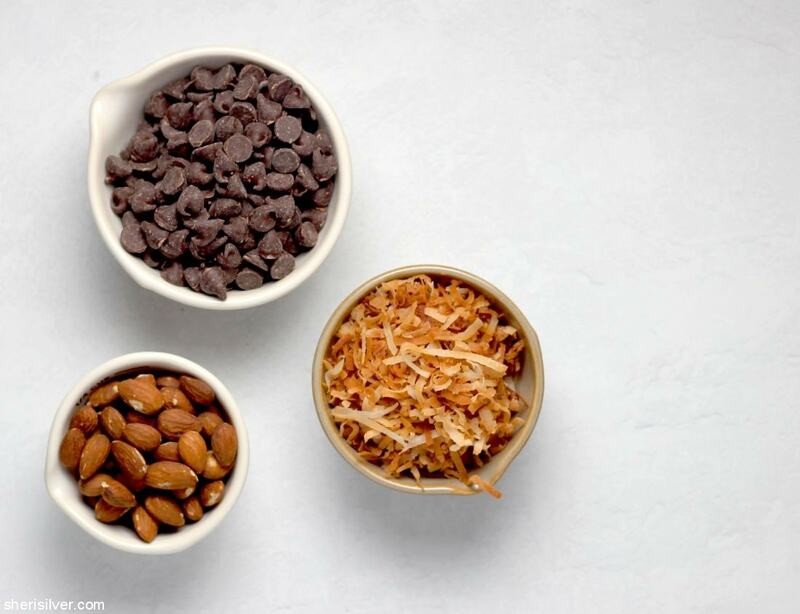 Spread the coconut in an even layer on the sheet and bake till golden brown, stirring frequently and watching after 5 minutes to prevent burning. Cool completely; set aside 1/4 cup. Beat the butter, cream cheese and sugar till light and fluffy. Add one egg and the vanilla – beat till combined. Add the flour and salt and beat till combined. Add 1/2 cup of the cooled coconut and beat again, till just incorporated. Separate the dough into two halves and place each between two sheets of plastic wrap or parchment paper. Roll each dough to about 1/4″ thickness. Stack the doughs on a baking sheet or cutting board and refrigerate for at least one hour, or up to three days. Line 2 baking sheets with parchment paper; beat the remaining egg with one tablespoon of water. Working with one dough at a time, remove plastic wrap and place on one of your prepared baking sheets. Cut out circles with a drinking glass or cookie cutter (I used a 2 1/2″ cutter here). Remove trimmings and set aside. Place 1/2 teaspoon of the almond paste in the center of each circle. 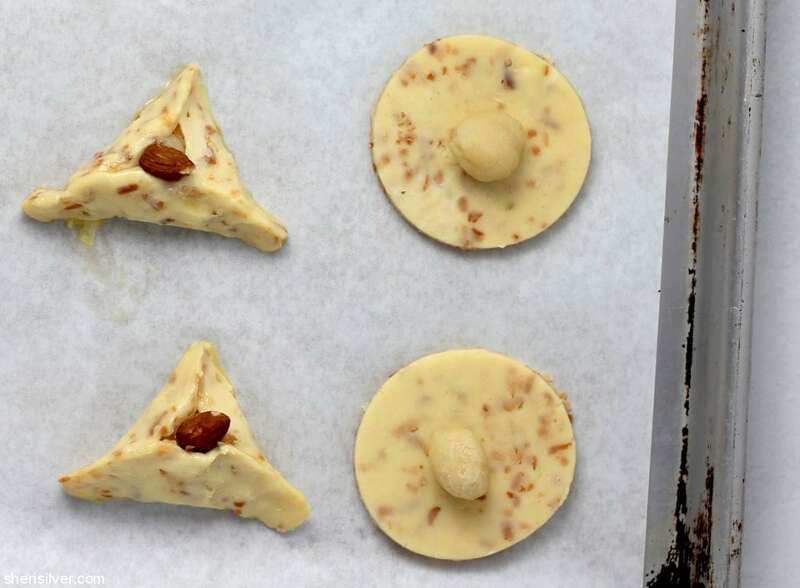 Fold the dough into a triangle shape and pinch the corners firmly together. 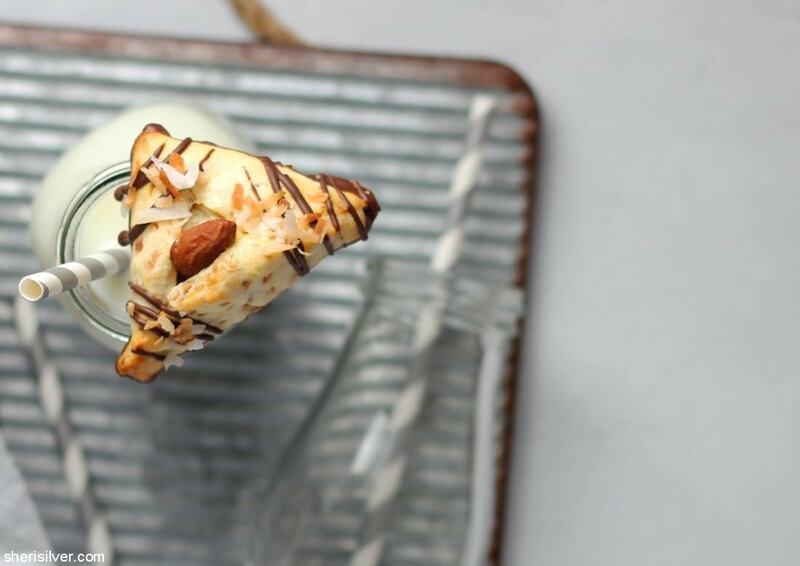 Gently press an almond into the center. Brush tops of cookies with a little of the beaten egg. Repeat with remaining sheet of chilled dough, and again with the dough scraps. Place cookies in the freezer for 10-15 minutes. Pre-heat the oven to 375 degrees. Bake cookies, one sheet at a time, until golden; about 15 minutes. Transfer to wire racks to cool completely. Line a baking sheet with parchment paper. Melt the chocolate chips and shortening in the top half of a double boiler set over barely simmering water. Working with one cookie at a time, dip the bottom into the melted chocolate, and scrape the excess off along the rim of the bowl. Place on your prepared baking sheet. Transfer the remaining melted chocolate to a disposable pastry bag or ziploc bag; snip a tiny opening in the corner. 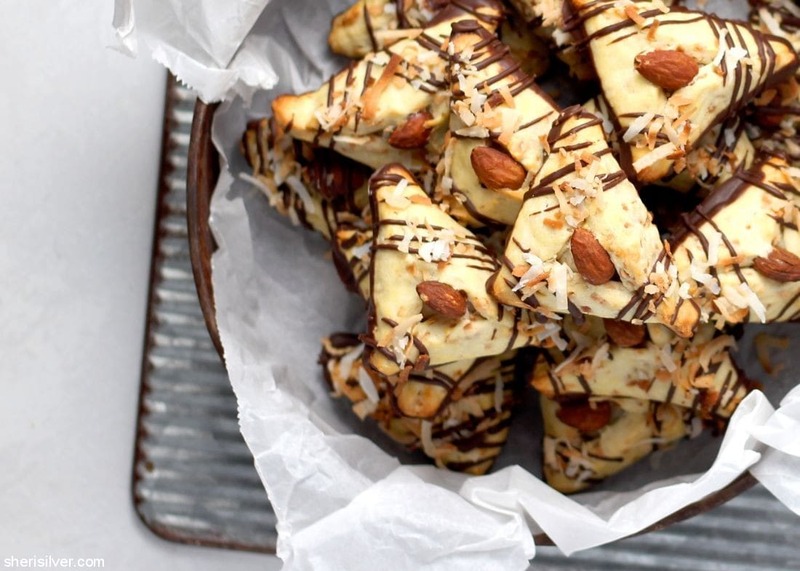 Drizzle the tops of the cookies with the melted chocolate, and sprinkle with the reserved coconut. Place in the fridge to set. 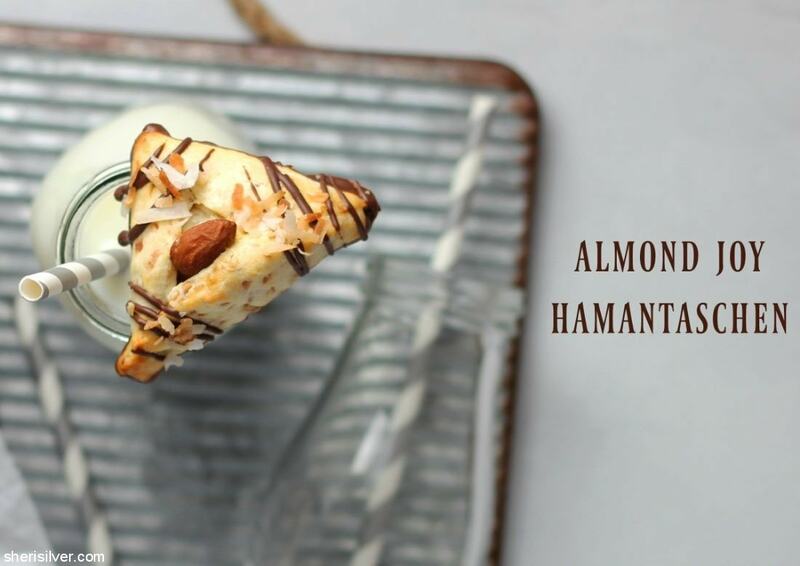 Discover more hamantaschen (and all of my favorite cookie recipes) on Pinterest!